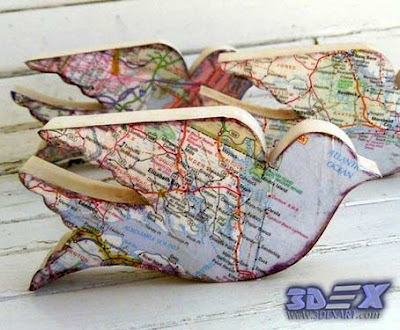 In the soul of each of us lives a traveler. And let not everyone manage to make a trip around the world, we still dream about it and, as far as possible, we are in other countries. 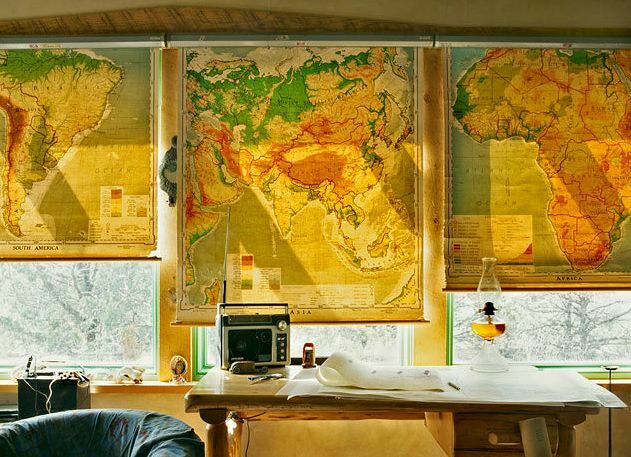 Geographic world maps in the interior can be considered indefinitely. World map art mural not only gives aesthetic pleasure from contemplation but also create an easy atmosphere of romance and adventure, bring pleasant thoughts about distant countries and memories of your trips. We offer you to see how you can use world map decor in the interior of the house. 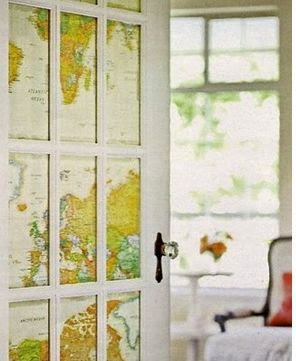 A World map wall art will become the central decorative element of the interior of the room. Today we will not consider the standard version of placing a small world map wallpaper on a wall in a frame or simply pinned with buttons. 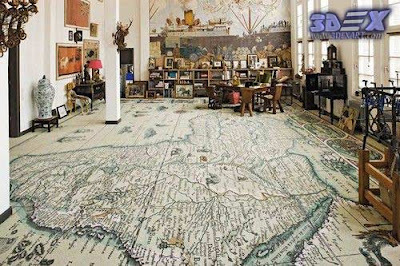 But if you have a large-scale world map mural, you can completely cover the wall with it. 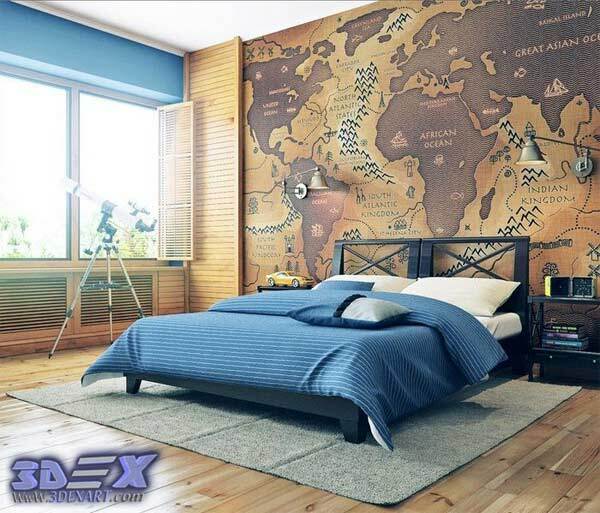 In addition, now you can buy or order a photo world map wallpaper with your chosen image or vinyl decorative stickers on the wall. 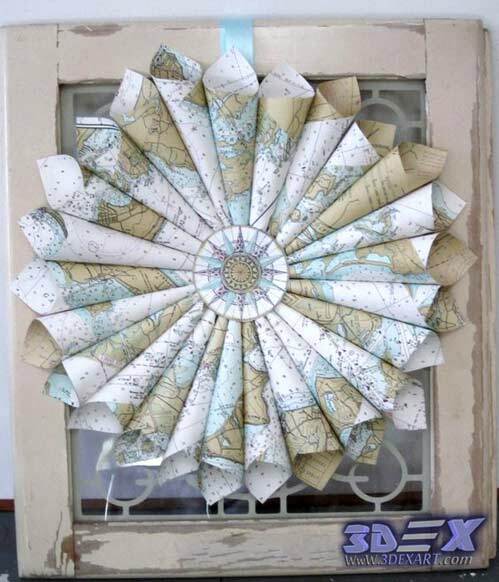 World map wall decor in the interior can be modern, vintage navigation or abstract stylized. 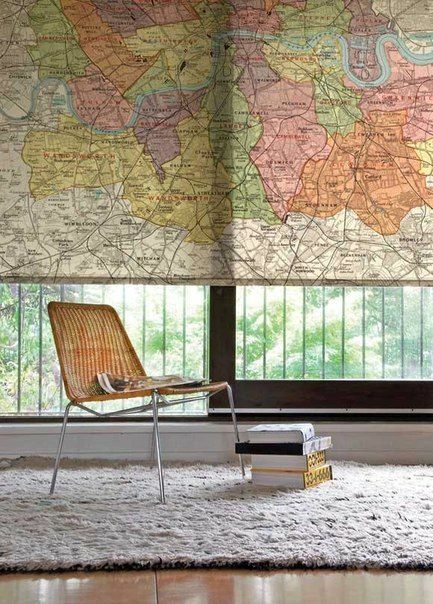 It can be a map of the world, part of the world, a country, a city or a metro scheme. 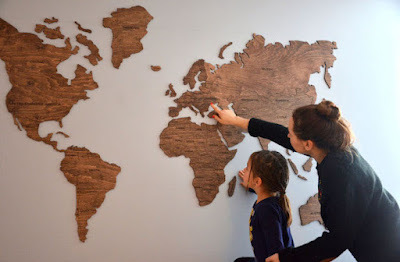 Most often, the image of the world map is decorated with the walls of the bedroom, but so you can decorate the world map walls in any room - bathroom, nursery, living room or kitchen. Very interesting option for a children's room. 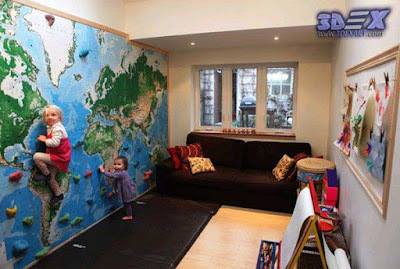 Climbing hooks are fixed on the wall with a world map wall decor and soft mats beneath them. 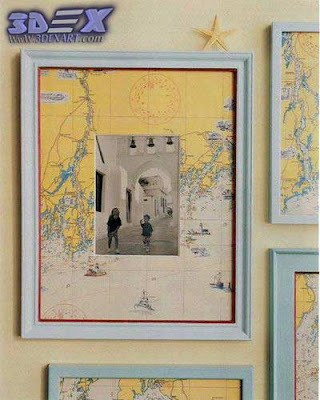 Pay attention to the map wall decor - it is made in the style of fantasy and also "upside down". 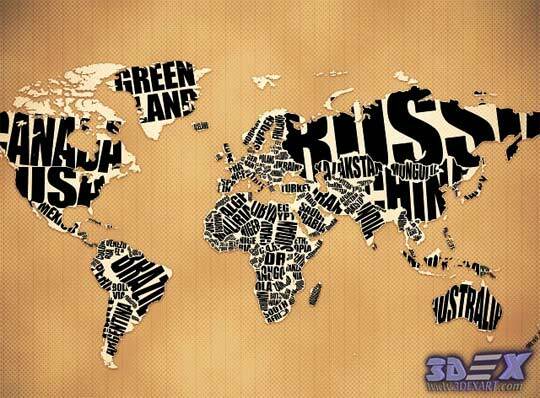 Instead of continents - the oceans, and in place of water spaces are located kingdoms. 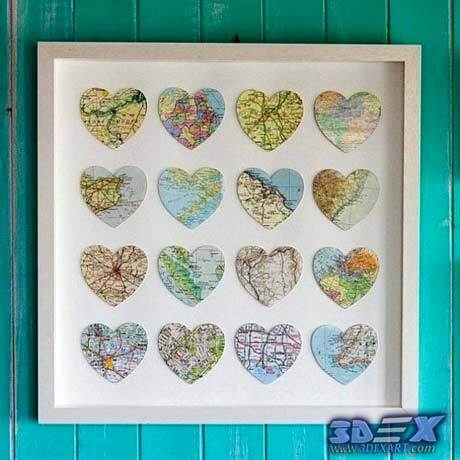 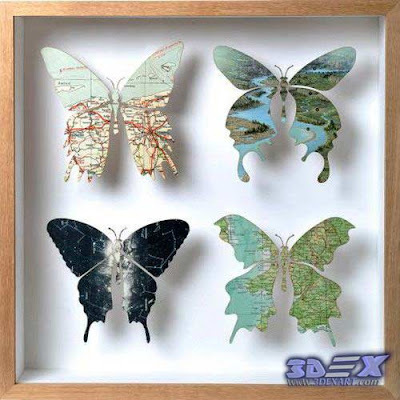 For interiors with modern styles, high-tech style stylized images of continents in the form of dots, lines, letters and other artistic world map decor techniques will do. 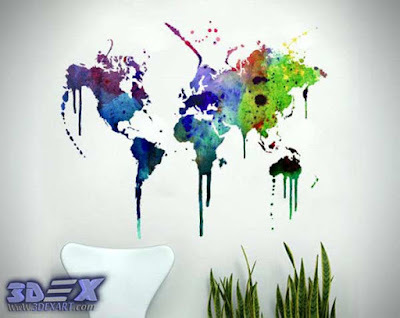 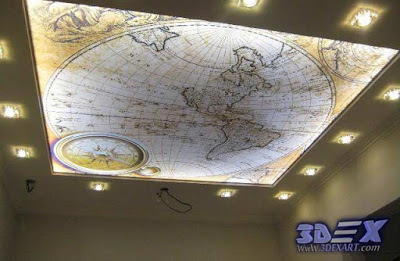 If the world map wall decor is quite common, then it is unique to find such a decoration of the floor or ceiling. Nevertheless, this is also an interesting and original version. Do not turn the whole room into a world map. 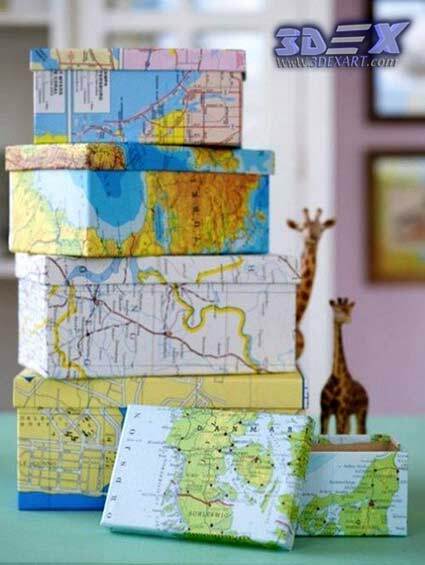 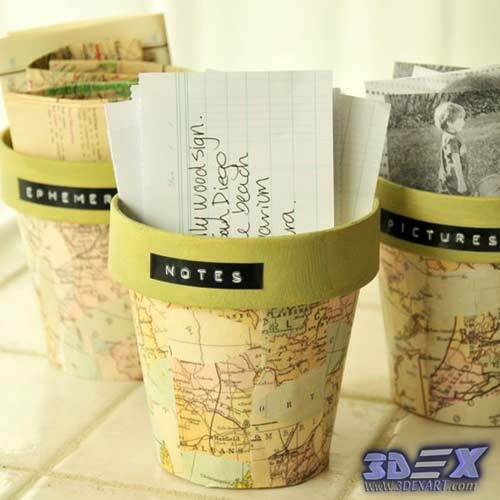 If you decide to make cards with the floor - you do not need to decorate both the walls and the ceiling, it is enough to support the general theme with small maps of the world on the wall or in accessories. 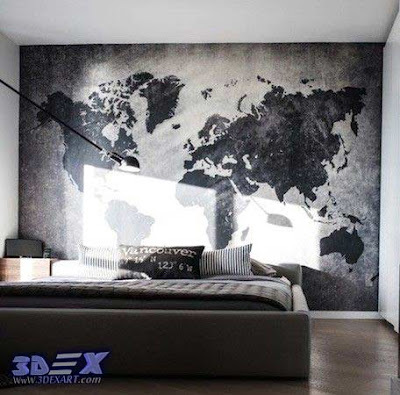 Although this is an interesting solution when the world map wallpaper decor smoothly go to the ceiling. 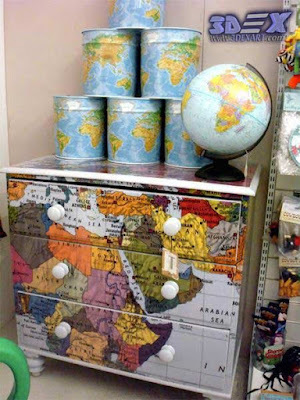 But in this case, in order not to overdo it, there are no more objects with cards in the room. 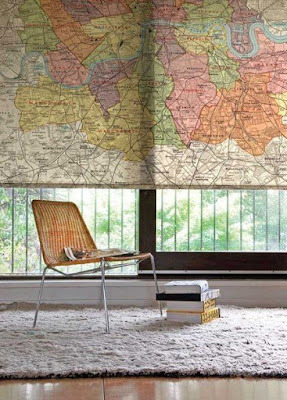 World maps in the interior can be present as curtains or roller blinds on windows. 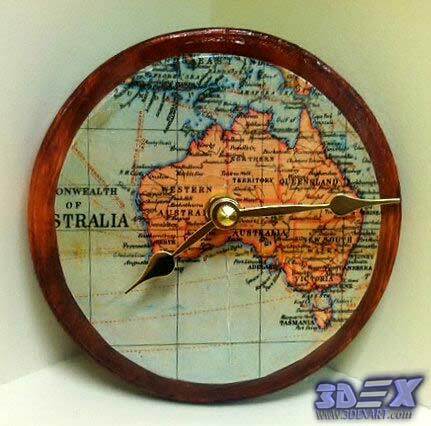 It can be made by themselves and ordered from the manufacturers. 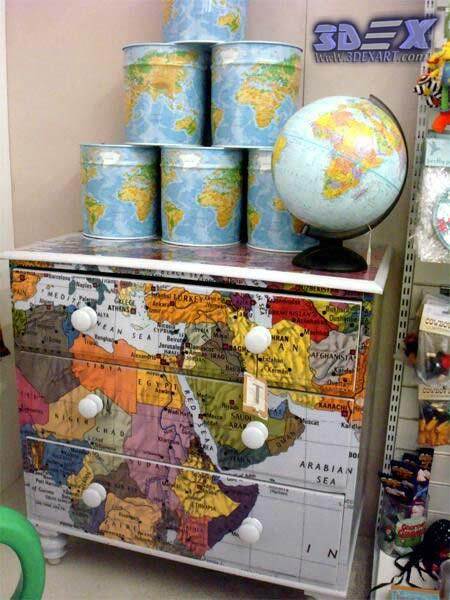 You can decorate different furniture with maps of the world. Geographic maps cease to be cards, turning into the decorative cover of cabinets, chests of drawers and other pieces of furniture. 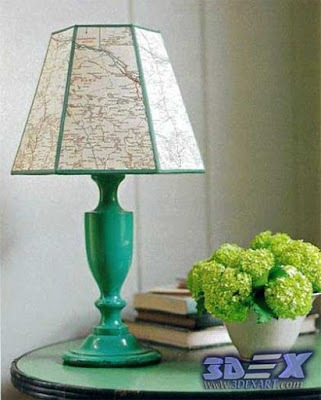 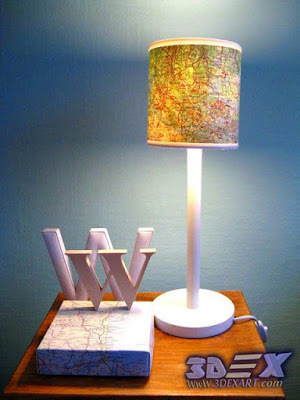 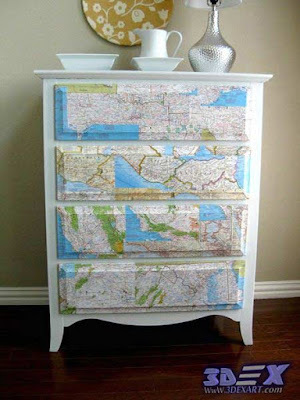 As a rule, a paper map is glued to furniture in decoupage technique. 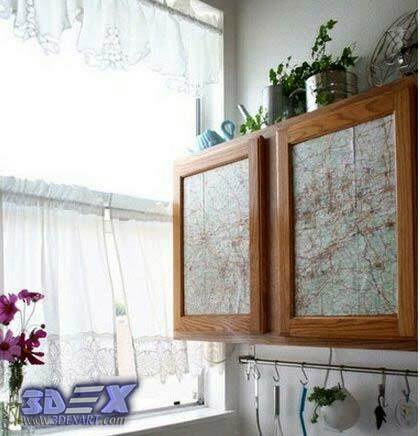 And it looks much more interesting than just hanging a map on the wall. 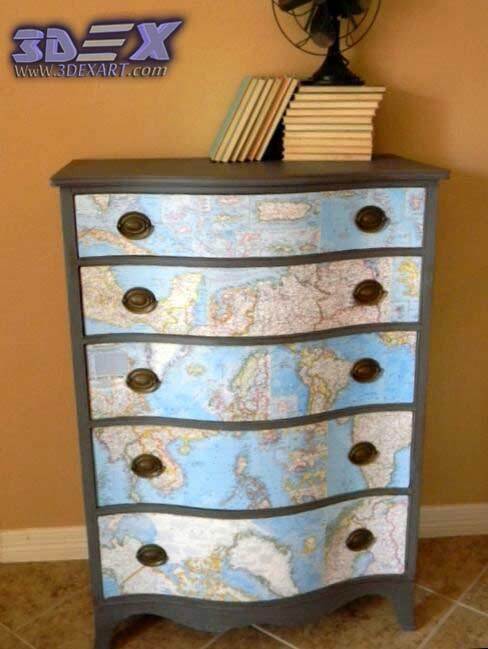 Any chest of drawers with world map decor will be unique. You can completely cover the entire surface of the chest, and draw only drawers. 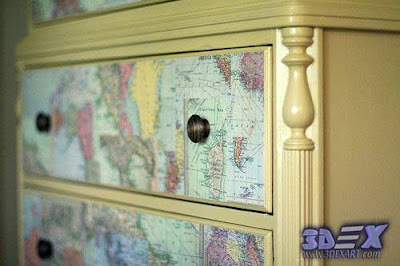 In the same way, you can decorate the doors of the cabinet with world maps. 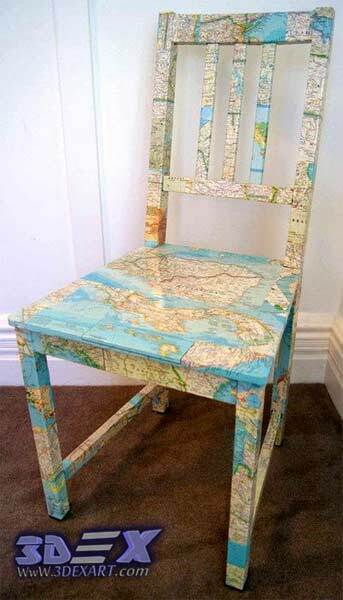 And in this chair and a table decoupage in its pure form. 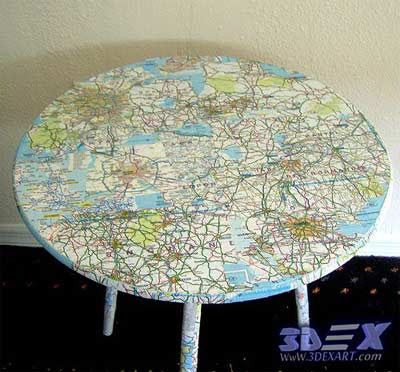 Geographic World maps cover all the details of furniture, from the legs to the crossbeams on the back. The maps of the world, illuminated from within by a lamp, acquire volume and look very unusual. 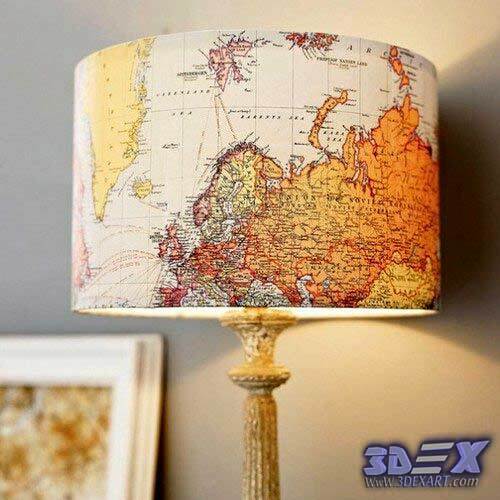 But to glue world maps is better on factory planes and lampshades for safety, moreover and to cover all fireproof composition for a fabric or a tree. 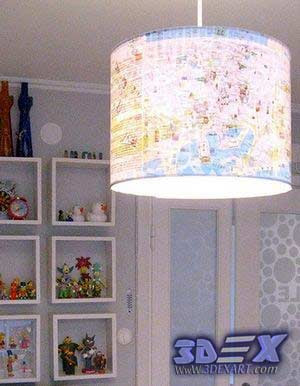 A lot of small items and accessories will support the world map art of the interior. 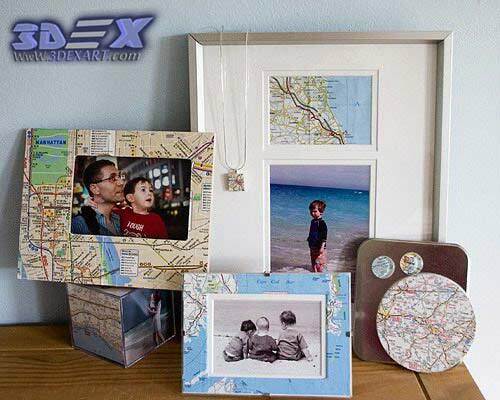 Pictures and photo frames, boxes and coasters, watches and dishes - all this you can put on cards or do decoupage. 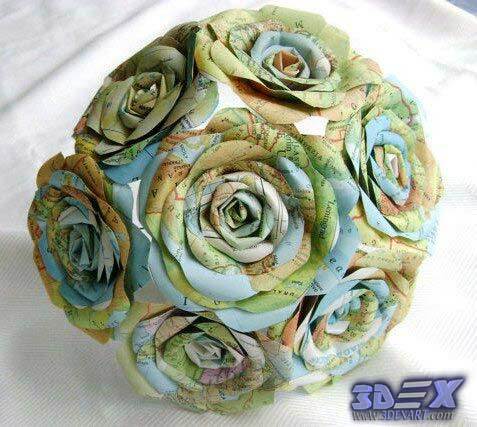 In our time, the time of active use of GPS navigators paper road maps has become almost unnecessary. 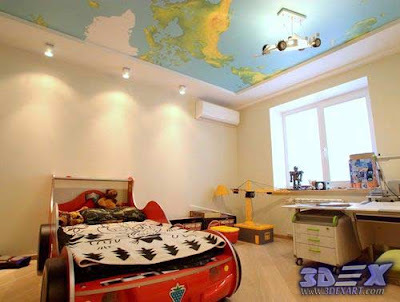 Therefore, you can easily collect different mural from friends and acquaintances and make it a lot of nice and useful things for the interior. 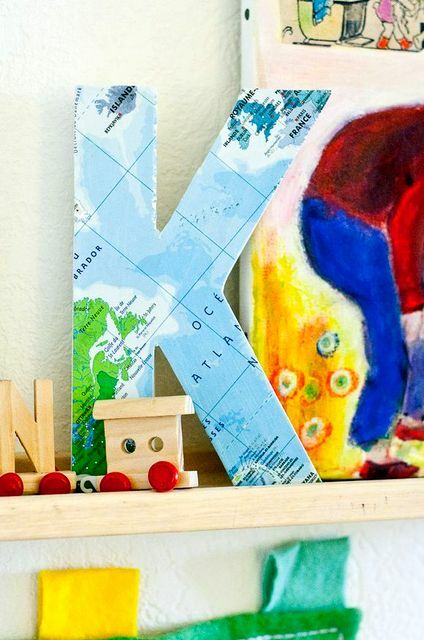 Wooden letters are a popular trend in interior design. 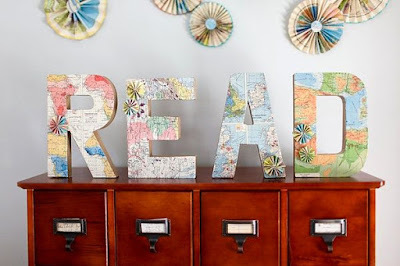 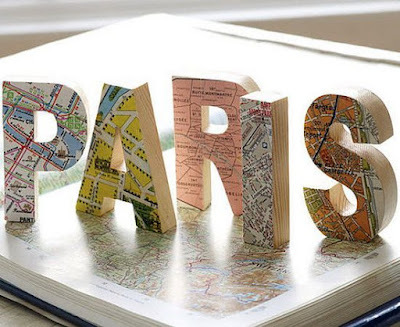 The letters and words, pasted with world maps, will look even more original and stylish.